SINCE MANY PASTORS OF CHRISTIAN CHURCHES ARE REPORTED TO BE FREEMASONS, WHAT NEW WORLD ORDER RAMIFICATIONS MIGHT THERE BE? - Christian Updates - New World Order. SINCE MANY PASTORS OF CHRISTIAN CHURCHES ARE REPORTED TO BE FREEMASONS, WHAT NEW WORLD ORDER RAMIFICATIONS MIGHT THERE BE? We will examine the possible religious and New World Order ramifications that might flow from many pastors and key leaders of Christian churches being Freemasons. You will be shocked!! In this article, we shall be examining the possible New World Order implications of the fact that many Christian pastors and key church leaders are Freemason, and of the possible New World Order implications. As we have discuss , we Fundamental Christians have been greatly, and increasingly, dismayed as many Christian organizations have begun drifting ever more leftward, and ever more apostate. Yet, most of these pastors continue to preach sermons that are valid Gospel, as they present the Plan of Salvation accurately. Our only argument with these leaders comes when their organizations cooperate with apostate Protestant and New Age churches, and with the Roman Catholic Church. Fundamentalist pastors and authors have never question these leaders' Salvation, only their association with people and organizations which have openly denied key doctrines of Christianity. If these leaders are Freemasons, then we are faced with an entirely new set of circumstances! If they are Freemasons, then we have to assume that they secretly, in their heart of hearts, agree with the doctrines of Freemasonry! We have to assume that, as they are presenting the Gospel in their sermons, they aresecretly denying Christian doctrines in their heart of hearts. We have to assume that, as they areextolling Jesus Christ as our Beloved Lord, Master, and Savior, they aresecretly believing Freemasonry teachings about Jesus Christ. Let us now examine certain Freemasonry teachings on key doctrines of our Christian faith so we can understand what is probably really on these Christian leaders' hearts as they present the Gospel publicly. Remember, God judges the issues of the heart, while we humans tend to judge superficially, on what we see on the surface only. Well might these leaders consider God's words to Samuel concerning Saul, "But the LORD said unto Samuel, Look not on his countenance, or on the height of his stature; because I have refused him: for the LORD seeth not as man seeth; for man looketh on the outward appearance, but the LORD looketh on the heart." ( 1 Samuel 16:7 ) If these many pastors are Freemasons, then they have the heart of a Freemason, and they believe what Freemasons believe. Let us examine these Masonic doctrines now. Freemasons Believe That They Possess Spiritual Wisdom That Is Greatly Superior To The Teachings of Any Individual Religion. 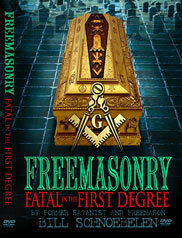 Therefore, Freemasonry sees itself as the spiritual Foundation upon which all other religions have been constructed. Therefore, each individual religion, including Christianity, has only a partial truth, while Freemasonry contains the whole truth. Mr. Pastor, as you are up on the podium preaching the Gospel, are you secretly believing that Christianity is nothing more than an individual religion that contains only partial truth? What does Scripture say about the Foundation that is acceptable to God? Bible Answer #2 -- In Luke 6:48, Jesus declares that He is the Rock, the only spiritual foundation upon which a person can rely for eternal salvation. Then, in verse 49, Jesus speaks of any other religious foundation. "But he that heareth, and doeth not, is like a man that without a foundation built an house upon the earth; against which the stream did beat vehemently, and immediately it fell; and the ruin of that house was great." In other words, any other spiritual foundation is really no foundation at all, and when God's Judgment begins to beat upon that person, his fall will be very great, and very eternal. Pike also states that lying is necessary, on page 102, Teaching for the 3rd Degree. "A spirit ... that loves wisdom and contemplates the Truth close at hand, is forced to disguise it, to induce the multitudes to accept it ... Fictions are necessary to the people ..."
Mr. Pastor, when you are preaching during your sermons about the purity of the Gospel, are you, in your heart of hearts, really thinking that these "masses" of the people to whom you are preaching "must needs" be taught error? Do you arrogantly believe, as Freemasonry teaches, that only the Adepts can know the pure truth? Do you really believe that the Bible you are teaching are really only "fictions".? Therefore, Mr. Pator, when you preach to the "masses" in your sermons, if you secretly believe this Freemasonry doctrine, that these people need to be lied to now, for their own good, you are ascribing to the doctrine of Antichrist! Mr. Pastor, when you are preaching to the sincere Christians in your congregation about the loving Savior, Jesus Christ, do you secretly believe that Jesus of Nazareth was but a man like us, and that His life and Gospel are nothing more than "the revival of an older legend"? Then, Albert Pike ends this little section by saying, "Masonry ... belongs to all time; of no religion, it finds its great truths in all." Freemasonry is truly the global religion of the Antichrist. Since Pike teaches that it predates all religions, and goes back to the very beginning of time, we assume he means that Freemasonry goes back to the Garden of Eden, where we see exactly this type of the "worship of yourself" being taught, don't we? In the Garden of Eden, we see Satan speaking through the serpent to Eve, extolling her to eat of the fruit of the Tree of Knowledge, even though God had forbidden it. Satan told Eve that, once she ate of that fruit, she would become like gods. Let us review the exact Scripture, "For God doth know that in the day ye eat thereof, then your eyes shall be opened, and ye shall be as gods, knowing good and evil." (Genesis 3:5) In other words, Satan was teaching Eve the same lie as is being taught in Freemasonry, and in the New Age religion, that each person has a "godhead" within them, and that all they have to do is to "discover" it through occult meditation and practices!! Therefore, Mr. Pastor, since you are a Freemason, you really believe this lie about each person being as the gods!! Therefore, Masonry places its stamp of approval on the many practices of the ancient pagan religions, such as temple prostitution and the sacrificing of children!! Mr. Pastor, as you are preaching Biblical morality to us "poor masses", are you really believing in the "morality of every creed" of the ancient pagan religions? Freemasonry teaches and embraces ALL of these forbidden, "abominable" practices even today, as we demonstrate in NEWS1084, NEWS1085, and NEWS1086. Mr. Pastor, when you are preaching to your audiences, are you harboring this teaching of Freemasonry, that it is perfectly all right to practice witchcraft, to consult a medium, to practice human sacrifice, and to use divination? Since you are a Freemason, we can only conclude that you do. Is this THE reason that Freemasonry has had to be so very secretive all these years? Of course, it is!! When you review the list of materials Freemasons study, in NEWS1084, NEWS1085, and NEWS1086, you will see all these abominable and forbidden practices with the exception of human sacrifice. E. What does Freemasonry teach about God? 1. "... Satan is not a black god, but the negation of God ... For the Initiates, this is not a Person, but a Force, created for good, but which may be used for evil." Now, the Truth is finally out of the bag!! Freemasonry labels itself occultic and of Antichrist with this statement! Let us examine it in its component parts. a) Both Satan and God are not persons, but are Forces. God reveals in Daniel 11:38, in the midst of prophecies concerning the coming Antichrist. "But in his estate shall he honour the God of forces:" The Antichrist will not honor the True God, but the God of Forces!! Therefore, Pike has just labeled Freemasonry as being of Antichrist with this statement! Therefore, Mr. Pastor, by being a Freemason, you are participating in an organization dedicated to the support of Antichrist! b) Pike's statement, above, equates Satan and God, a tremendous abomination to Biblical Truth! Consider what God has to say about the difference between Himself and Satan: "Thus saith the LORD the King of Israel, and his redeemer the LORD of hosts; I am the first, and I am the last; and beside me there is no God." (Isaiah 44:6) God declares Himself to be preeminent over all other supernatural beings. Yet, classic occultism declares just the opposite. In the Satanic book of symbols, entitled, "Magic Symbols", by Frederick Goodman, Brian Todd Publishing House, Ltd., 1989, p. 57-59, we see this Satanic teaching. "The Latin words refer to an ancient occult dictum: 'What is above is like unto that which is below'. The diagram once again points to the duality of the universe ... the lower or darker world is a reflection, or weaker image of the upper world ... there is an upper world and a lower world, and in some curious way these are reflections of each other, though the upper world is one of light and the lower world is one of darkness ... From spirit, reflecting itself, proceeds the duality of the created world. It is as though light needs darkness to give itself form. This is one of the mysteries of the occult tradition ... the whole of the created world is really an attempt by God to see Himself. He creates an image of Himself, a reflection of Himself, that He may see. Without this creation of His own shadow, He would not be complete. (p. 57-58) This brings us back to Pike's statement that Satan is the negation, or opposite of God. Therefore, these occultists believe that God created a shadow of Himself, a being we call, Satan!! Mr. Pastor, when you are teaching Biblical Truth from the Bible about God, you must really be thinking that this is the false teaching, the "fiction" which you must propagate amongst us "ignorant Christians" until Antichrist can arise and lead us to a new, higher path of consciousness!! c) Finally, Pike's statement, above, that the occult can be used for either "good" or "evil" is also standard Satanic teaching. If a person uses his or her knowledge of the occult for "good", they are said to be practicing "White Magic"; but, it a person uses their knowledge of the occult for "evil", they are said to be practicing "Black Magick". And, when a World Teacher, or Avatar, uses his occult knowledge for "Good", he is referred to as "The Christ"; but, if he uses his occult knowledge for "Evil", he is referred to as "Antichrist". Thus, you see occultic authors such as Alice Bailey, Ruth Montgomery, and Peter Lemesurier fretting about whether the coming New Age Avatar -- World Teacher, the Great One -- will be "The Christ" or "Antichrist". Mr. Christian Pastor, who is also a Freemason, must believe the same nonsense. Wow! Masonry teaches we are going to see the Adolf Hitlers and the Josef Stalins, and the Neros, of this world in Heaven!! Because God is infinitely good, He is incapable of anger over sin, and will allow everyone into His Heaven in the end! Thus, Masonry does not teach Final Judgment Day, or eternal punishment in Hell for their sins. Mr. Pastor, when you are urging people to come forward to accept Jesus Christ as their Savior, are you secretly believing this is also one of the "lies" to propagate to these "ignorant" Christians, until such time as Antichrist arises, to lead them to the "higher" truth, that there is no Judgment? Thus, Mr. Pastor, when you are teaching the Biblical doctrines about God, you must be thinking of the Freemasonry God in your heart of hearts! Is this another instance where you believe you must lie to the ignorant masses of people until Antichrist comes to lead them to Masonry's "higher" spiritual knowledge? 4. Freemasonry teaches that "perfect truth is not attainable". (Albert Pike, "Morals and Dogma of the Ancient and Accepted Scottish Rite of Freemasonry", p 223, Teaching of the 14th Degree). Therefore, Jesus must be a fraud and a liar, when He says, "I am the Way, the Truth, and the Light." Or, when Jesus says, "And ye shall know the truth, and the truth shall make you free." [John 8:32] Did you notice that Jesus told us we shall know the truth? Is Jesus a liar and a fraud? Is this what you believe, Mr. Pastor? F. What does Freemasonry teach about Jesus Christ? This is the most important question of all, isn't it, because there is no forgiveness of sin and no eternal life in Heaven without Jesus Christ. In John 5:22-23, Jesus boldly stated, "For the Father judgeth no man, but hath committed all judgment unto the Son: That all men should honour the Son, even as they honour the Father. He that honoureth not the Son honoureth not the Father which hath sent him." Therefore, we see that God the Father has given all matters of Judgment of all men unto His Coequal Son, Jesus Christ! Jesus reiterates this Truth in 5:26-27, but He also reveals the Truth that He is Self-sustaining just as the Father is Self-sustaining! "For as the Father hath life in himself; so hath he given to the Son to have life in himself; And hath given him authority to execute judgment also, because he is the Son of man." So, let us now examine what Freemasonry teaches about Jesus Christ. 1) Albert Pike states the following doctrine concerning Jesus Christ in Chapter 26, or the 26th Degree, "Prince Of Mercy, or Scottish Trinitarian". On page 562-3, we see that the thought of a Supreme Being unknown to the Human race [God] produced the Universe which "produced the Spirit, the Mother of the Living, and Wisdom of God. Together with this Primitive Existence, Matter existed also ... eternal ..."
"Buthos and His Thought, uniting with Wisdom, made her fruitful by the Divine Light, and she produced a perfect and an imperfect being, Christos, and a Second and inferior Wisdom, Sophia-Achamoth, who falling into chaos remained entangled there, became enfeebled, and lost all knowledge of the Superior Wisdom that gave her birth. Communicating movement to chaos, she produced Ialdaboath, the Demiourgos, Agent of Material Creation ... Ialdabaoath produced an angel that was his image, and this a second, and son on in succession to the sixth after the Demiourgos ... Ialdabaoath, to become independent of his mother, and to pass for the Supreme Being, made the world, and man in his own image; and his mother caused the Spiritual principle to pass from him into man so made; and henceforward the contest between the Demiourgos and his mother, between light and darkness, good and evil, was concentrated in man." "And the image of Ialdabaoth, reflected upon matter, became the Serpent-Spirit, Satan, the Evil Intelligence. Eve, created by Ialdabaoth, had by his Sons children that were angels like themselves. The Spiritual light was withdrawn from man by Sophia, and the world surrendered to the influence of evil; until the Spirit, urged by the entreaties of Wisdom, induced the Supreme Being to send Christos to redeem it. Compelled, despite himself, by his Mother, Ialdabaoth caused the man Jesus to be born of a Virgin; and the Celestial Savior, uniting with his Sister, Wisdom, descended through the regions of the seven angels ... and entered with his sister into the man Jesus at the baptism in Jordan." What incredible blasphemy is this? Jesus Christ was created by an inferior small god, Ialdabaoth? But, first, Ialdabaoth created Eve, when he "reflected upon matter, then became the Serpent-Spirit, Satan. Therefore, Eve was really created by Satan! Then, Ialdabaoth's Mother forced him to create Jesus Christ as a spirit. Then, this Jesus spirit "united" with his Sister, Wisdom, and together they came upon the human Jesus at the baptism in Jordan. This is the Gnostic heresy of the "Christ Consciousness" which states that Jesus was a mere mortal man, who had no idea he was the Messiah. At the baptism by John the Baptist in the Jordan River, the Christ Consciousness entered into Jesus and suddenly He knew He was the Christ, and began calling Himself Jesus Christ. This is the heresy being advocated by all the New Age Movement, and is the concept which Antichrist will invoke when he arises. He will say that the Christ Consciousness which came upon Mohammed, Jesus, Buddha, etc., is the same Christ Consciousness which he has, only now it is more advanced. Therefore, Antichrist will be able to convince the world that he, through his Christ Consciousness, actually is all Messiahs in One. Again, this concept is the same Gnostic lie which stated that the Christ Consciousness spirit that came upon Jesus at the baptism, left Him just before He died. But, Pike then "reveals" that Jesus did not actually live a normal human life, but "took upon Himself only the appearance of a body ..." (Albert Pike, "Morals and Dogma of the Ancient and Accepted Scottish Rite of Freemasonry", p. 564) Then, a few pages later, Pike returns to this heresy. "The Light [Jesus] could not unite with the darkness. It put on the appearance of a human body, and took the name of Christ in the Messiah, only to accommodate itself to the language of the Jews ... But the Chief of the Empire of Darkness [Satan, which is Ialdabaoth] caused Him to be crucified by the Jews. Still, He suffered in appearance only ..."
Folks, this teaching of Freemasonry about the Person and Work of Jesus Christ precisely meets the Biblical definition of Antichrist!! In 1 John 4:2-3, the Holy Spirit gives us this definition of Antichrist: "Every spirit that confesseth that Jesus Christ is come in the flesh is of God: And every spirit that confesseth not that Jesus Christ is come in the flesh is not of God: and this is that spirit of antichrist, whereof ye have heard that it should come; and even now already is it in the world." Therefore, when Freemasonry denies that Jesus Christ is come in the flesh, they are exhibiting the spirit of Antichrist. Interestingly, the Amplified Commentary states these verses this way: "Every spirit which acknowledges and confesses that Jesus Christ the Messiah actually has become man and has come in the flesh is of God ... And every spirit which does not acknowledge and confess that Jesus Christ has come in the flesh, but would annul, destroy, sever, disunite Him, is not of God ... This non confession is the spirit of antichrist ..." Doesn't this teaching of Freemasonry accomplish precisely this type of denial, or non confession? Of course it does. Freemasonry teaching about Jesus Christ fulfills this Biblical definition of Antichrist exactly!! Therefore, when a Freemason addresses a crowd about Jesus Christ, he will present the Gospel accurately only because he arrogantly believes that the poor, ignorant "masses" of the people need to be lied to right now, because they could not take the truth. But soon, Antichrist will be on the scene, and he will lead the "masses" into a higher level of religious training. Then, and only then, will the "masses" be able to receive the "truth". What is the truth? Whom do Freemasons worship if they do not worship Jesus Christ? They say they worship God, but that "God" is not a Person, as Albert Pike has so eloquently told us, above. Their God is a "Force", which fulfills the Daniel definition of Antichrist! Do they worship a god which is a Person? Pike tells us that they do, and his name is ---- well, let me allow Pike to tell you, in his own words: "Lucifer, the Son of the Morning! Is it he who bears the Light, and with its splendors intolerable, blind [the] feeble, sensual or selfish Souls? Doubt it not!" (Albert Pike, "Morals and Dogma of the Ancient and Accepted Scottish Rite of Freemasonry", p. 321) Then, on page 567, Pike calls Lucifer the "Angel of Light" a term the Bible uses to denote the Pre-incarnate Jesus Christ. Do not be deceived: Freemasonry worships Lucifer. Remember, Freemasonry separates Lucifer from Satan, claiming they are not the same being. Satan is supposed to be the negation of God; he is the brother of Jesus Christ! Does this sound like Mormonism? It should, because Joseph Smith was a Master Mason, and Brigham Young was 33rd Degree. Christian author, Gary Kah, writing in his book, " En Route to Global Occupation", writes about Luciferian worship on page 114, "On 14 July, 1889, Albert Pike issued his instructions to the twenty-three Supreme Councils of the world, recorded by A.C. De La Rive, in La Femme et l'Enfant dans la Franc-Maconnerie Universalle (page 588). The following is an excerpt from his speech. Before we address the obvious, we would like to point out that Pike's statement that the "crowd" is to be told that Freemasons worship the God which they do not have to fear, i.e., their manufactured god of all Love; the Adepts are told the truth about whom Freemasons worship, because they can "properly receive" it. This arrogant idea about lying to the ignorant masses while reserving the truth for the mature Adept applies also to Masonic brethren below the 30th Degree. We have long realized that about 90% of all Freemasons have no idea as to the truth of the Masonic Lodge. Now, to state the obvious from Pike's statement, above: they worship Lucifer, the Light Bearer as Pike called him in Morals and Dogma! Do not be deceived. But, why should we have trouble believing that Freemasons worship Lucifer? Listen to one of the most important Masons of the 20th Century, Manly P. Hall. We have already shown that their teaching about Jesus Christ constitutes the teaching and the spirit of antichrist as defined in 1 John 4:1-4. Since this is true, then we must take the next step, to realize that the Bible foretells, in Daniel, that Antichrist will worship Lucifer/Satan! In Daniel 8:23-25, God foretells this about the Antichrist: "And in the latter time of their kingdom, when the transgressors are come to the full, a king of fierce countenance, and understanding dark sentences, shall stand up. And his power shall be mighty, but not by his own power: and he shall destroy wonderfully, and shall prosper, and practice, and shall destroy the mighty and the holy people. And through his policy also he shall cause craft to prosper in his hand; and he shall magnify himself in his heart, and by peace shall destroy many: he shall also stand up against the Prince of princes; but he shall be broken without hand." The "king of fierce countenance", above, refers to a king which practices Black Magick withcraft. Black Magick practitioners make no bones about the fact that they worship Satan. The term, "understanding dark sentences" refers to the many Black Magick spells and incantations they have mastered in order to command demons to do their bidding. "His power shall be mighty" because it is the supernatural power of Satan indwelling Antichrist. this power shall be very effective, as it will allow him to "destroy wonderfully". When this passage, above, says that "he shall cause craft to prosper in his hand", it also refers to Witchcraft; those in witchcraft commonly refer to it as "The Craft". Thus, from this Scripture, we should naturally expect that those who are teaching doctrines that are Biblically "of the spirit of Antichrist", should also practice the worship of Satan/Lucifer. They will naturally be expected to worship the same religion as Antichrist will worship. And, that religion is witchcraft, the worship of Lucifer. Pike then gives concrete evidence of Freemason's worship of Satan/Lucifer on the very front of the cover of Morals and Dogma ! Below the round seal of "God", Pike writes a phrase written in Latin, which proves to be a typical Satanic phrase. 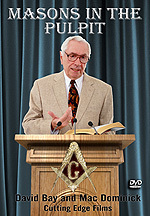 One look at this phrase would alert any Satanist that the contents of this book are Satanic! A Satanist would also understand immediately that all of Freemasonry is Satanic. What is this phrase? "DEUS MEUMQUE JUS" The literal meaning is "God and My Right"
Doc Marquis says this statement is a very typical one within Satanism. It has two meanings, one within the other. 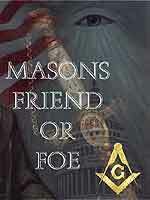 First, this phrase means that the Freemason can depend upon their God to determine their Right and Justice. Secondly, since the God of Freemasonry is Lucifer, Masons are saying that they are "using occult methods", through Lucifer, to achieve their Rights and Justice. Marquis says that this phrase is very powerful and very dangerous within Satanism. The second a Satanist sees this phrase in Latin on Pike's book, he knows the material within is Satanism, without reading a word! So, Mr. Pastor, if you are a Freemason, you share all these beliefs of Freemasonry. This brands you as a counterfeit Christian! As you are preaching the Truth of the Gospel, you are secretly holding to Luciferian beliefs. You are deliberately misleading the "ignorant masses" for their "own good", so that, when Antichrist arises, you may lead your followers to him! When Antichrist arises, amidst great signs and wonders, and claiming to be everyone's Messiah, he will be confronted by a great many skeptics, especially among Christians. The New World Order Plan calls for key religious leaders from every continent and every major religion to immediately step forward and shout to their respective followers, "This is the man for whom we have been waiting; let's follow him". How many Christians will blindly follow their pastors and key religious leaders into the arms of Antichrist? This is very, very serious business, indeed. Have you noticed the untraditional Crucifix which Pope John Paul II is constantly using in his Masses? This crucifix is the "Twisted Cross" created by Satanists in the 6th Century A.D., as their symbol of Antichrist!! Thus, when the Pope and other Catholic priests, hold this crucifix up before the worshippers they are unknowingly worshipping Antichrist! Freemason Protestant leaders are cooperating ever more closely with this future False Prophet! The fight against Abortion has probably contributed most effectively to this union between Protestants and Roman Catholics, as sincere members of both churches have bonded in their fight to end Abortion. Sad, but true. 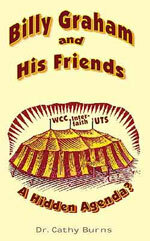 The Promise Keepers is another example of bonding between Catholics and Protestants. Soon, very soon, we will all be worshipping under the very same "church", the church of Antichrist. Already, an official global church has been formed, and is in the process of defining itself. In NEWS1094, we reported that a global church, called the United Religions, was formed in late June, 1997! They bill themselves as the "spiritual equivalent to the United Nations", and plan to be fully formed by June, 2000 A.D. This is the same year that all other aspects of the New World Order plan to be fully functional, to have their ambitious plans fully implemented!! Freemason Pastors -- how far you have fallen! Listen carefully to Jesus' Words of counsel to the Church of Laodicia, "Because thou sayest, I am rich, and increased with goods, and have need of nothing; and knowest not that thou art wretched, and miserable, and poor, and blind, and naked:"
You have no idea you are "wretched, and miserable, and poor, and blind, and naked". You think you are following a "higher revelation" than mere Christianity. You believe you are deliberately misleading us "poor masses of Christians" for our own good, that you may deliver us to Antichrist one day, for our more mature religious insight! Mr. Pastor and key church leader, please fall on your knees right now, and repent for this sin. Great as it is, you know it can be forgiven. Please turn away, before God's Judgment falls on you! To every other Christian who has exhibited blind faith in their Christian pastors and leaders, we urge you to understand the truth of that which we have given you, even though you will find it very difficult to do so. In this End of the Age period of unprecedented spiritual deception, you must not blindly follow any man, or any organization; rather, you must search the Scriptures to "prove the spirits", to see if they are from God or Satan. Your eternal soul is at stake!! Just the fact that such so many "Christian" leaders could be false prophets, in Lamb's wool, is a sure sign that the End of the Age is very, very near! The Apostle Paul stated, in 2 Thessalonians 2:1-12, that the Antichrist cannot appear until the Apostasy of the Church is complete, and until the Holy Spirit, Who restrains evil, is taken out of the way. Truly, you cannot find a more complete example of the Apostasy of the Church than the fact that so many of our Christian pastors and leaders are Freemasons. In this End of the Age, when unparalleled deception is the order of the day, you all must depend upon Scripture, not on human leaders! If you are looking at your Scriptures when Antichrist arises, you will NOT be deceived into following him. The End is very close. Are you spiritually ready? Is your family? Are you adequately protecting your loved ones? This is the reason for this ministry, to enable you to first understand the peril facing you, and then help you develop strategies to warn and protect your loved ones. Once you have been thoroughly trained, you can also use your knowledge as a means to open the door of discussion with an unsaved person. I have been able to use it many times, and have seen people come to Jesus Christ as a result. These perilous times are also a time when we can reach many souls for Jesus Christ, making an eternal difference.